Photographers searching for an affordable solution to smooth focusing may be interested in the new $15 adapter called the Follow Focus, created by a team of designers based in San Diego California. The Follow Focus can easily be attached to almost any DSLR camera and the lens system enabling you to quickly and smoothly change focus to create a wide variety of different effects. Check out the demonstration video below to learn more about the Follow Focus adapter which is taken to Kickstarter to raise the funds it requires to go into production. 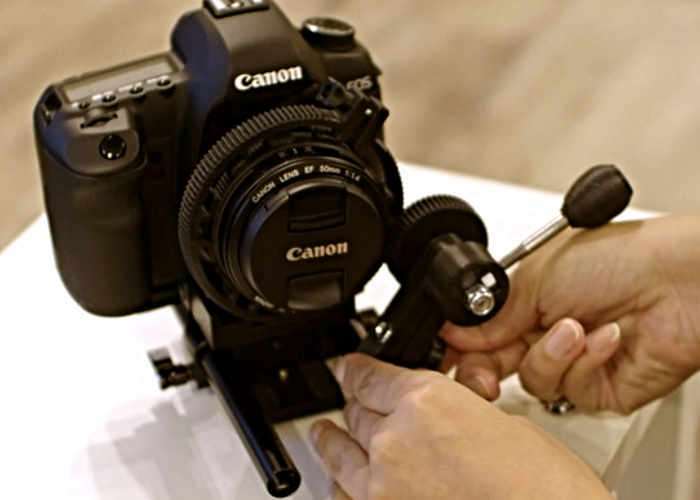 The $15 Follow Focus uses a traditional 15mm rod clamp design so it can be used in any rig. It is easy to assemble and make, using standard hardware that you can get at any hardware store, it makes it easy for anyone to get parts or make their own. It is designed to be simple and will be available assembled, as a kit, or downloadable to make it accessible to everyone. Using the $15 dollar follow focus, you can get smooth focus pulls that really bring quality to your video footage. Just like they do in the movies! For photography, it puts dslr focusing in your control. The design has virtually zero backlash and can be adjusted for different focus distances. Its super compact and light weight and the price makes it easy to have several if you have multiple cameras that you are using. The $15 dollar follow focus kit will come with a ring that matches your lens size. You can also get a custom size to match each of your lenses. We will have the rings available by themselves as well. Jump over to the official campaign page via the link below to make a pledge and become one of the very first to own the Follow Focus.